For the better part of two months, “The Week That Was” has provided an in-depth look at the past 7 days of what cannot be seen in the boxscore. From notable fights to controversial plays, the profiled stories have occurred over the time of a single week, where over 50 games were played and hundreds of goals were scored. However, as we move on in the season, the intensity of the matches rise as more teams are eliminated. The one downfall of this is that less saturation of games. A Saturday, for example, turned from a 13 game night in the regular season, to a 5 game night at the beginning of the 1st round, to what is now a 2 game night. Because of this, less occurs in a week and what does happen is often over-analyzed to a point of no return (see Raffi Torres suspension). “The Week That Was” will no longer be a weekly series, at least until the regular season starts up again in (hopefully) October. Now, the name will be shifted to, “The Weeks That Were”. Two weeks discussed, with only the most obscure and least-publicized happenings will be profiled. This inaugural edition of the bi-weekly feature will focus on the end of round one. When the New Jersey Devils defeated the Florida Panthers on Thursday night, only 8 teams remained in the hunt for the cup. There were upsets, dramatic finishes, and startling moments that ended with a second round that nobody envisioned. A few weeks ago, one of the most controversial moments of the year occurred when Ryane Clowe played the puck while on the bench. Not only did Jarrett Stoll (the puck carrier) notice this, but everyone watching observed this scene. Clowe got away scot free due to the lack of attentiveness by the referees, but he only earned style points for his efforts and no credit for being sly. While it was funny to some (not to Kings fans, of course), there was no way that would be re-created during the postseason because of the repercussions that one penalty can have. When all hope seemed lost for another innovative cheating tactic, David Legwand delivered with a tactic that was so sneaky that it wasn’t even noticed until days later (See the video here). During a scoreless game in the 4th matchup between the Predators and Red Wings, the puck landed in Nashville’s crease with a swarm of red jerseys approaching. To the confusion of everybody on the ice, the puck was never found following the scrum and the match resumed normally. 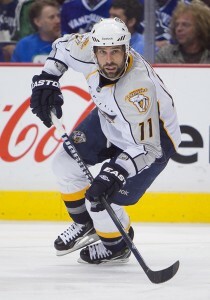 When looking back on the situation, Legwand pounces on the loose puck and covered it with his glove. Had this been discovered, Detroit would’ve been awarded a crucial penalty shot. To avoid this, he brought the puck to the bench, quietly handed it to the trainer, who brought it back to the dressing room. The reception received from what happened is somewhat mixed. One side of the argument brings up the point that Legwand did cheat and his act ruined the integrity of the game, while the other point of view is that the move was funny and extremely intelligent. Personally, I did find it very funny, but I know that if I was a Red Wings’ fan, I’d be incredibly upset. Regardless, the Predators did win game 4 (and the series), part of which could’ve been as a result of David Legwand’s actions. In the hockey world, almost every nationality gains a stereotype that is adopted by fans and media alike. Canadian players are almost always called “grounded” and “passionate”, while Russians are deemed as “enigmatic”. While these descriptions can be true for a select few, it does not generalize the entire group. However, the description often given to Swedish players is “nice” and “respectful”. From what we have seen with Nicklas Lidstrom, Nicklas Backstrom, Henrik and Daniel Sedin, and Gabriel Landeskog, it is quite evident that the country develops very smart hockey players that come off as incredibly mild-mannered. Two of the poster boys of Swedish hockey today are Daniel Alfredsson and Henrik Lundqvist. Aside from Toronto who despises “Alfie”, these two hockey players are incredibly well-respected and epitomize how to play a decent and honest game. Well, most of the time, at least. Monday, April 23rd was an anomaly for the two, as both uncharacteristically lost their temper. In game 6 in their series, a controversial goal with under a minute remaining got Lundqvist incredibly bothered, lashing out against the referees of the game. Following this outburst, Lundqivst criticized the officials in the post-game scrum, inferring that there was motive to make the game last longer (not too different from Tortorella’s interview following the Winter Classic). King Henrik’s tirade, however, was nothing compared to that of the one that Daniel Alfredsson had. Following a lack of ice time and powerplay time, Alfredsson returned to the bench and threw a temper-tantrum. The emotion showed by Alfie came off as quite negative (Colin Greening clearly agreed), yet it was quite interesting to see such passion shown by a hockey player. The Canucks, Bruins, Penguins, Red Wings, and Blackhawks are known as some of the best teams in the National Hockey League. Some are known for their current era of dominance, others for their goal-scoring, and others for their toughness. Despite each having unique team builds, they all have a common factor: None of these teams made it past the first round. The Stanley Cup champions? They’ve been overthrown. The dominant and healthy Penguins? Beaten by Giroux and company. The President’s Trophy Winners? Ran into a brick wall Jonathan Quick. Needless to say, the teams that are eliminated is stunning. So instead of what was expected, there are some very odd teams remaining in the hunt. In the Western Conference, the Kings and their second lowest league-offence are moving forward, along with the surprising St. Louis Blues, the balanced Nashville Predators, and the underrated and undervalued Phoenix Coyotes. In the East, the top-placed New York Rangers advanced, along with the inconsistent New Jersey Devils, the underdog Philadelphia Flyers, and the Washington Capitals who underachieved in the regular season and overachieved once making it. On the surface, it seems like one of the most obscure second rounds of the past decade. When looking deeper into the matter, it is quite evident that is not the case. The teams still remaining sit first (Blues), second (Kings), third (Rangers), fifth (Coyotes), ninth (Devils), tenth (Predators), twentieth (Flyers), and twenty-first (Capitals) in the league for goals-against per game. Save for the final two teams (where Holtby was unbelievable and Bryzgalov beat out a horrendous Fleury), teams with better defense won the games. It is also worth mentioning that only two teams remaining were among the top 10 highest-scoring teams, and only four were in the top 15. It is truly proving the saying that, “defense wins championships.” It will be interesting to see if there are any offensive explosions in the next round, as it certainly doesn’t appear that will happen. In the first round of the NHL playoffs, there were 16 games that went to overtime, totaling 19 overtime periods. During these “sudden-victory” moments, there were triumphant goals from scorers such as Joel Ward that eliminated the former champions, unbelievable saves from goaltenders like Jonathan Quick, and disappointing efforts from players such as Corey Crawford. However, there was one thing that overtime lacked: a penalty. For the first 15 overtime games, the referees have swallowed their whistles and let the teams battle it out, so that way there is no advantage for any side. That changed in the 16th and final overtime game of the opening round, when the Devils visited South Florida to play the Panthers. Only 3 minutes into the first overtime, Kris Versteeg got a slashing penalty and put the Panthers down by one. The Devils did not capitalize, but rookie Adam Henrique scored the series winning goal later in the second overtime. The penalty call did not go without any questioning. Versteeg clearly had a slashing motion, but the penalty was hardly bad enough to be the first overtime penalty of the 2012 playoffs. Among the multiple overtime games that occurred, there were holds, trips, and hooks that were clearly seen but let slide. It is also worth mentioning that the slash Versteeg committed did not create a scoring chance for his team or stop a scoring chance for the Devils. Regardless, this sets a precedent that penalties can be called during overtime and that teams need to remain disciplined or it will cost their respective clubs.